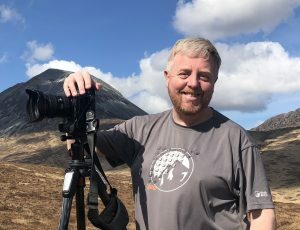 Rich Dyson, LRPS is a professional PR & press photographer in Edinburgh who also has a passion for landscape photography. He is regularly published in a variety of national newspapers including The Times, Daily Telegraph and Guardian. He has also been exhibited numerous times in venues throughout Scotland including The Scottish Parliament. His friendly and welcoming approach to teaching is extremely popular with clients from absolute beginners through to seasoned photographers. Each of the workshops is designed in such a way that the fundamentals are explained in simple language and then placed into context through practical application. Workshops conclude with a review of the images taken to ensure that all the principles have been embedded so that the attendee leaves with a good understanding of the subject matter. Rich can tailor individual sessions to your needs. If there are any aspects of photography that aren’t covered in the standard workshops, don’t hesitate to contact Rich who can provide an individual plan.